"Sonic the Hedgehog Goes Hog Wild!" 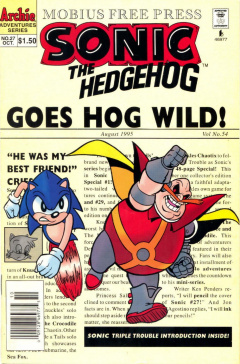 Sonic the Hedgehog 27 is the twenty-seventh issue of the Sonic the Hedgehog comic series. It was released in October 1995. This comic features one story: A Scrambled Hedgehog. It also features an introduction to the Sonic Triple Trouble comic special. Late at night, deep in the heart of Robotropolis, two unknown dog rebels are, disguised as SWATbots, walk up to a wall of one of Robotnik's factories. One of the rebels, named Sleuth, starts spraypainting a secret code onto the wall, complete with a 'Sonic loves Sally' message to create the illusion of vandalism. They put their SWATbot disguises back on and head out. Not long afterwards, Sonic runs through Robotropolis on an errand to find secret messages from other rebel undergrounds. He runs by the spraypainted message, complaining that there should be an easier way to receive these messages. Just as he looks at the secret message, he's caught by a SWATbot patrol. He runs down the alley, avoiding an aerial bombardment of lasers and legions of SWATbots. He runs past a corner in the alley, only to meet a waiting SWATbot by surprise. It jumps out, catching Sonic by surprise. He rams into the SWATbot, knocking himself out cold. Some of the SWATbots arrive, as they prepare to take Sonic to Robotnik. In one of Robotnik's laboratories, Sonic comes out of his unconscious state only to see Robotnik's figure. He's still woozy, as he lays on a laboratory table, tied down. Robotnik tells him to take his time getting up, as he has the time now to implement his schemes and foil his enemies. Sonic looks up, asking who he is. Snively thinks he's faking amnesia, asking Robotnik to defeat him once and for all, but Robotnik has his own idea. He has never seen Sonic show this kind of weakness or such a docile nature, so he thinks he really has amnesia, and thus he has no clue about anything. He walks over to Sonic, faking a friendly tone and begins to aid Sonic. He first asks if Sonic remembers his name, which he cannot remember anything at all. Robotnik then goes on to ask if he remember him, his trusted mentor and advisor, which Sonic claims he can't remember either. He then checks the straps holding Sonic down and tells him to get some rest. Once asleep, he and Snively head out to continue planning their scheme. Later on, after Sonic has recovered, Robotnik has Sonic fighting in a training session: against duplicates of the Freedom Fighters. Robotnik and Snively watch proudly as Sonic is able to take out the duplicates of his friends with absolute ease. Snively is concerned, however, that if Sonic can take out Robotnik's 'useless' duplicates, that the Freedom Fighters may be able to take out Sonic. As Sonic finishes up the duplicates, Robotnik doesn't show any concern, as he expects the Freedom Fighters will be hesitant to fight Sonic. With the training session complete, it's time to take on the real thing. Robotnik tells Sonic about the 'evil' Princess Sally and tells him to begin his mission to scout for Knothole Village and observe the 'terrorist' Freedom Fighters. Giving a salute, Sonic leaves Robotropolis on his mission to located Knothole, which he still can't remember the location of. To aid in the mission, Robotnik has planted a micro-transmitter on Sonic to determine his location and watch the mission proceed. He's also set up some demolition tractors to follow Sonic, allowing them to arrive at Knothole shortly after he finds it. He celebrates his presumed victory, despite Snively's apprehension. Still running through the Great Forest, Sonic reaches a fork in the path he's following. While thinking of which way to go, he looks over at an old tree trunk, which seems familiar to him. He lifts the top of the tree trunk off, revealing a tunnel, realizing that the entrance to Knothole is secret and not just along a path. He jumps down, all-the-while with Robotnik watching and waiting to confirm the final location of Knothole. While running down a long corridor to Knothole, many alarms are set-off. Rotor, in his lab, watches Sonic as he starts to run toward Knothole. Sally arrives and asks Rotor what the problem is, but he can't initially determine why Sonic is setting off the alarms. He finally determines that Sonic has a device attached to him. Sally orders that the tunnel be sealed off so Sonic doesn't reach the entrance. Sonic is able to notice the door closing the tunnel off, so he speeds up as fast as he can, but he doesn't make it in time, stopping at the door just as it fully closes. Confused, he looks around trying to find a way to get past. The rumbling of the tractors is also becoming apparent as Robotnik puts them in position over the secret entrance. He begins the countdown to send the tractors down, not knowing of Sonic's issue, until Snively notes it to him. Despite the inconvenience, Robotnik had been prepared for such a situation. He takes out a microphone and calls Sonic through the micro-transmitter. He tells him to lift his left hand toward the door and press on a mechanical instrument on the top of his knuckles. He does so, releasing a powerful laser beam from the object that successfully destroys the door. With that obstacle out of the way, Sonic continues on his mission. Rotor and Sally watch Sonic destroy the barrier, realizing that Sonic has turned evil. As he approaches the triple junction of the tunnel, Sally orders Rotor to take any and all actions to stop him from arriving in Knothole. Meanwhile, Sonic arrives at the triple junction, a room with three doors, one of which leads to Knothole. He begins to try to guess which door to go through, just as the feed from the transmitter is interrupted. Taking a gamble, he selects door three and enters. The feed returns back, leaving Robotnik confused as to what tunnel he selected. Rotor tells Sally that he's coming through with the transmitter still going. With all options exhausted, Sally orders the tunnels to be flooded. Continuing down the tunnel, Sonic is met with a huge wave of water. Thinking he's gone the wrong way, he turns back to head out. Robotnik decides to go ahead with the tractor invasion anyway and continues the countdown. As the water gets closer to Sonic, a loud rumbling noise is heard. The countdown ends, with the tractors destroying the tunnel ahead of Sonic. With only a few seconds to spare, Sonic quickly enters into a spindash and blasts through the ceiling in an attempt to get to the surface. While spinning through the dirt, he wonders how he instinctively knew to spindash. Despite his escape, the water continues to flood the tunnel he creates, threatening to drown him if he stops. The feed, in the meantime, has stopped and Robotnik can no longer watch the progress of Sonic. Sonic continues to spindash through the dirt, but is losing air due to the space. Nobody is able to get a visual on the status of Sonic, whether it be Rotor or the cameras on the tractors. Oddly, Robotnik finds himself rooting for Sonic's survival, just as he pops out of the ground gasping for air on the surface. Landing on the ground, he celebrates and decides to continue the mission. Meanwhile, Robotnik's feed comes back online, so he orders the tractors to be recalibrated to reach his location. Sonic, continuing to run straight from where he was, notices a small village in the distance: Knothole. With the perimeter breached, Sally orders to sound the alarm. In the village proper, the alarm goes off. Antoine takes command and orders everybody to get the children into shelters and themselves to the barricades. Behind the barricades, the Freedom Fighters prepare to ward off whatever Robotnik has sent, only to see Sonic running toward their position. Before they can react, he rushes through the barricade with ease, sending many of the fighters flying away. Robotnik has acquired a Chaos Emerald. A mysterious new villain appears. Three witch doctors are introduced. An introduction to Tails' own mini-series. Sally appears in a hot pink string bikini. Cut from the editing room by Sally herself. A battle between Sonic and Knuckles. Sonic is pleased by the preview and wants to watch it again, but the preview tape has become extremely tangled. The duplicates Sonic fight against are the duplicates created by Robotnik from issue 3 of the Princess Sally mini-series, deemed useless.